« Google Street View: Coming soon to a street near…Me! Went to Field Day in Victoria Park, London yesterday. Foals headlined and were amazing, really tight and energetic – looking forward to seeing them again at Brixton later in the year. The weather did it’s best to ruin the day, alternating between drizzling pouring it down for the whole day. But the prize for ruining everyone’s fun must go not to the weather, but to the idiot organisers who managed to completely screw-up the toilets by way of poor planning and farcical management on the day. This picture gives you an idea of how long the queues were, but what you can’t quite see is that when the queue reaches the toilet area itself, it goes through a zig-zag layout as if it were a queuw at Alton Towers. Even with that in place, the line literally reached from one side of the festival to the other. I felt sorry for the girls that had no choice but to stand in it. I’ve been to a good 10-12 festivals of various sizes in my time, and I’ve never seen it managed so badly. They had nowhere near enough toilets for the number of people there, they had urinals lumped in with the cubicles so that queues formed where they didn’t need to, there was not enough signage and not enough marshals trying to help people find the right queue, instead of having arguments with paying customers that were rightly outraged at the situation. At one point, I saw through the fence that only about a third of the urinals were in use, with the rest of them standing empty. 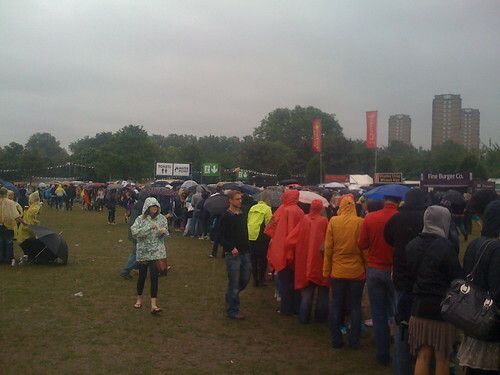 Yet the useless marshals had everyone queueing in one giant line for no reason. When I suggested that they have a seperate queue for urinals to speed things up the marshal told me to just get in the queue but push through it! They actually made all the guys get into the zig zag and push through all the girls to get to the front, instead of just letting them through a side gate. Unbelievable. This entry was posted on August 10, 2008 at 5:19 pm	and is filed under Music, Rantings. 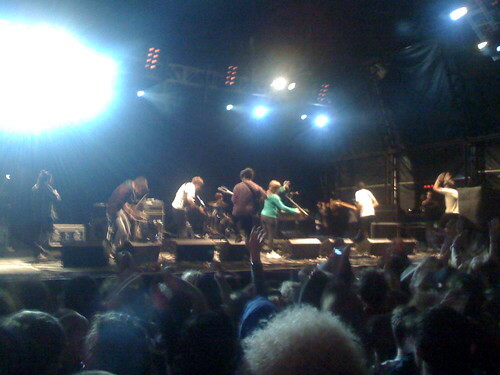 Tagged: Field Day, Foals, organisation, review, Toilets, useless. You can follow any responses to this entry through the RSS 2.0 feed. Both comments and pings are currently closed. Good photos – my review and photos are on the gigcam blog.